PVC-O, Chinese name Biaxially oriented PVC, is the latest evolution of PVC pipe, through a special orientation processing technology manufacturing pipe, the extrusion method will be used to produce PVC-U pipe axial and radial Stretching, so that the pipe in the PVC long chain molecules in the biaxial regular arrangement, access to high strength, high toughness, high impact, anti-fatigue of the new PVC pipe. PVC-O pipe in a substantial increase in the overall performance of the pipe at the same time, but also substantial savings in the use of raw materials, is worthy of the name of the environmental protection and energy saving high-tech new products to promote China’s plastic pipe industry upgrading and development plays an important role. PVC-O pipe with its unique performance advantages can fully meet the urban water supply, fire, farmland water conservancy, rural people drink, water-saving irrigation, industrial and mining enterprises and other areas of water supply requirements. Has a broad development prospects. The molecular structure of the pipe is changed from single orientation to double orientation, and the chain structure is changed to the mesh structure. The layered structure obtained by stretching the material can be seen by the naked eye. O Density: PVC-O is basically the same as PVC-U. O Tensile properties: Axial growth of about 28%; ring growth of about 55%. O Impact energy: increased by about 400%. (Drop hammer impact test PVC-U 64Nm, 80Nm damage; and PVC-O up to 300Nm). O Bending performance: similar to PE, far more than PVC-U, anti-foundation settlement capacity enhancement. O low temperature performance: -20 ℃ below the pipe still has a very good toughness. O point load performance: multi-layer network structure can effectively prevent the point of the load damage, the requirements of the backfill material greatly reduced. O Notch effect: does not like PVC-U as a linear cracking phenomenon, the energy will be transmitted to both sides, inhibit cracking. PVC-O pipe has been successfully developed abroad for more than 40 years. It is based on PVC-U pipe, in the high elastic state, the use of axial and radial two-way stretch process, the molecules obtained biaxial orientation, the formation of mesh structure, which greatly improved the various properties of the pipe. • The earliest foreign PVC-O pipe was developed in 1972 by Petzetakis using “mold pull”. Then the Netherlands Wavin, Rollepaal company, Spain Molecor, Formosa Plastics Group and other companies are also using a variety of successful development of PVC-O pipe technology. • PVC-O pipe in its performance significantly increased at the same time, but also save more raw materials, reduce energy consumption and carbon emissions, is truly environmentally friendly energy-saving new products. So many countries have developed the relevant product standards, PVC-O pipe in foreign countries to obtain a more extensive promotion and application. ISO16422: 2006 is the international standard for PVC-O pipe for water supply. • Some research institutions in our country have been focusing on PVC-O pipe research since 1990. 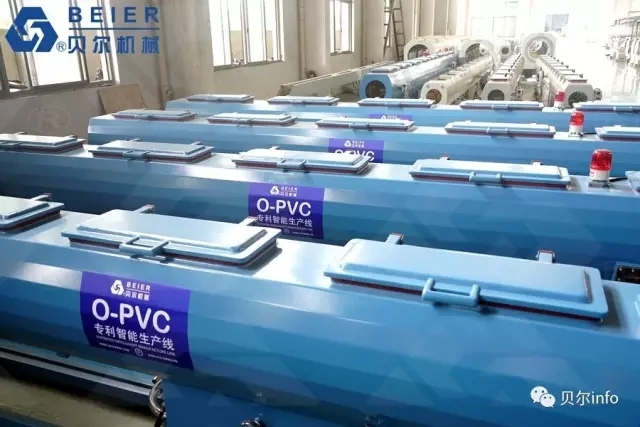 Beijing Chemical Industry University, Beijing Plastics Association, the National Chemical Building Materials Testing Center and other units of the experts to do a lot of basic research work for China’s PVC-O pipe lay the foundation for the development. After 2000, some domestic enterprises have also started the development of PVC-O pipe, Hangzhou Boda, Inner Mongolia Yili, Zhejiang Zhongcai, Hebei Baoshuo also made a lot of development work and made important progress. • In December 2014, the Ministry of Construction has issued the standard CJ / T445 for water-resistant biaxially oriented polyvinyl chloride (PVC-O) pipe fittings and fittings for water supply, so that the promotion and application of PVC-O pipe in China can be followed The standard. PVC-O pipe and PVC-U pipe performance comparison: processing technology, structure, performance.